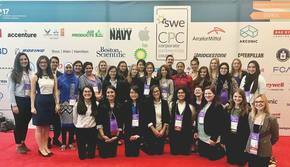 ​The Society of Women Engineers (SWE) is an organization that was created to help foster the growth, success, and advancement of women within STEM fields, as well as achieve recognition for the contributions already made to STEM fields by women. SWE aims to establish engineering (and all other STEM fields) as an extremely valid career choice for women through networking, outreach, scholarships, training programs, conferences, and more. ​At UNM, we aim to provide the community with outreach events that get local kids excited about STEM. We also aim to provide our members with a strong support system of STEM students (of all genders) to help each other through school and create new relationships. If SWE sounds like the organization for you, please sign up for our mailing list to get up to date information on upcoming events and meetings. Subscribe to our Facebook updates and follow us on Instagram at sweunm to stay updated!